Darth Vader has some new neighbors at the National Cathedral. Two stone carvings are being created in the Cathedral's Human Rights Porch depicting civil rights pioneer Rosa Parks and Mother Teresa. The sculptures are expected to be completed by Easter. The Parks statue will be done first, followed by the one for Mother Theresa. Stonecarver Sean Callahan is working on the depictions that were sculpted by North Carolina artist Chas Fagan. The stone carvings in this porch celebrate those who struggle to bring equality and social justice to all people, according to the Cathedral. “The people selected to appear in the iconography of the Human Rights Porch were chosen because of their extraordinary actions and contributions to the cause of human rights, social justice, and the welfare of their fellow human beings,” said Cathedral Dean Samuel T. Lloyd III. Three full-figure statues reside above the portal: Archbishop Óscar Romero, former First Lady Eleanor Roosevelt and former Cathedral Dean and Bishop of Washington John T. Walker. Another carving, the “Human Rights Half Boss,” depicts the biblical verse, “Let justice roll down like waters and righteousness like an ever-flowing stream” (Amos 5:24). Parks' refusal to give up her Montgomery, Ala., bus seat to a white passenger in 1955 is often cited as the start of the movement against legal segregation. Mother Teresa founded her own order of Catholic nuns that expanded to 125 countries to care for the poor. Callahan is the Cathedral's longtime carver. He joined the Cathedral in 1987, apprenticed under the late Vince Palumbo, and carved many of the angels, crockets, finials, and other elements of the west towers, according to the Cathedral. 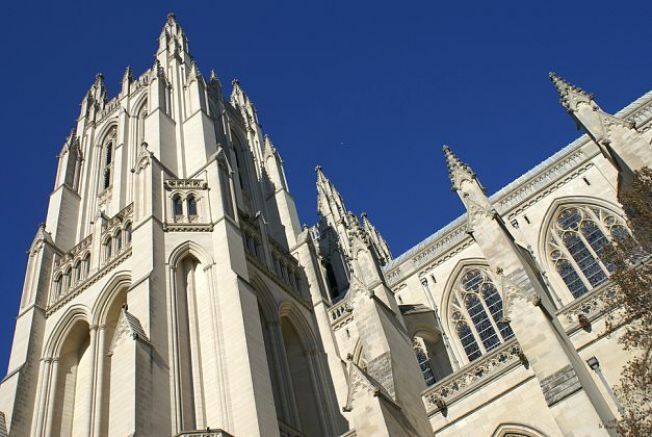 When the Cathedral was completed in 1990, he moved on to exterior restoration of the White House and projects at the Lincoln Memorial. He returned to the Cathedral in 2004, where he has picked up where he left off, carving tablets, shields and lettering, as well as re-carved damaged and deteriorated elements. The Darth Vader sculpture resides outside. You can find it by looking high on the northwest tower. It was created in the 1980s after a decorative sculpture competition was held for children. Darth finished third in the contest and was honored with a place on the historic structure.